When it comes to understanding diamonds, it is best broken up into the Four 'C's. The Four Cs are four main factors that influence the quality, rarity, and subsequently, the price of a loose diamond. There are many factors that these beauties are graded on, but the majority of diamonds can be understood by learning what the Four Cs mean, as well as how to use them to describe a diamond. Notice the chart below. The colors in this chart give you a clue as to what grade a diamond will fall into. The more clear, or colorless, a diamond is - the more rare and valuable. The scale begins at the letter 'D' and goes all the way to 'Z' with D being the most ideal colorless quality diamond. Diamonds are produced under extreme pressures and high temperatures within the earth's crust. Undergoing such extremes often leave marks or characteristics both within and on the outsides of diamonds; these are called inclusions or blemishes. Diamonds that escape the earth's crust with no inclusions or blemishes are among the rarest and therefore extremely valuable and precious. The cut of a diamond does not refer to the shape of it - although diamonds do come in many shapes including round, square, and even heart shaped! But the 'CUT' of a diamond represents how well that particular shape is in geometric proportion; optimizing the diamond's fire, sparkle, and brilliance. The most common shape of diamond is called a Brilliant Cut (Round). 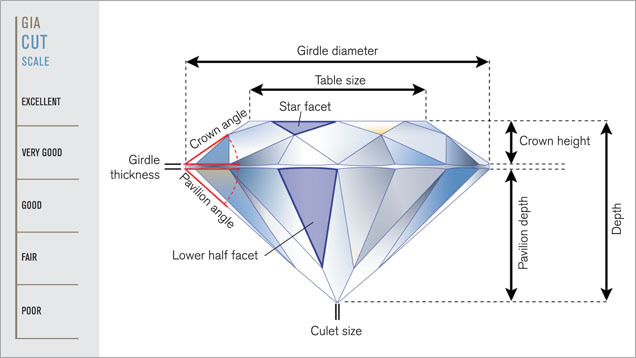 Below is a chart to illustrate the many small faces (or facets) that need to be in proportion to each other in order to maximize a diamond's brilliance. The word Carat many times is confused with the word Karat - which is pronounced the same way but refer to two very different measurements. In jewelry, both terms are used which can be confusing for some. When referring to white or yellow gold, Karat is used to denote how pure the gold content is: such as 14 karat or 18 karat; you can find some great 14kt & 18kt gold pieces here! Carat refers to a unit of weight measurement and is equal to 0.2 grams - which is about the same weight as a paper clip. The way carats are used is much like a dollar bill broken down into 100 pennies. $1 = 100 pennies is the same as 1 Carat = 100 'points'. Using this we can articulate diamonds: A 50-point diamond weighs 0.50 ct. The chart below gives an average comparison to the millimeter diameter equivalent to carat weight.